Find out why New Zealand’s Trevor Loudon changed my thinking about almost every political event in America since 1920’s. How can so many of our best and brightest leaders in politics, business, media, and academics be so wrong about so often wrong about so many things? Loudon reminds of facts we all once knew but forgot, because few people mention them today. He gives new information, including secret documents that were briefly made public in Russia before Vladimir Putin took control. He leads to conclusions which are both astonishing–and logical. 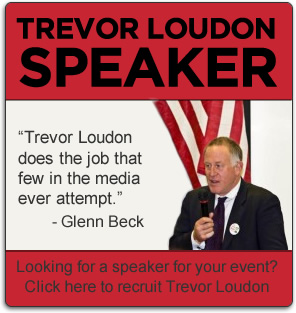 Loudon will speak at two area events Saturday, July 25. First breakfast with Trevor at 9:30 am (Shore Diner, Tilton & Fire Roads by Parkway Exit 36 in Egg Harbor Twp.) $10 additional cover over regular menu price to defray expenses. Then, 6 pm catered reception/dinner with the author at beachblock home of one of our members near Plaza Condo (4600 Block) in Atlantic City. 100 donation for dinner/reception. Attendance at dinner deliberately limited to encourage one-on-one conversations with the author. Loudon’s latest book “Barack Obama and the Enemies Within” explains how a small group of radicals changed politics of his native New Zealand in 1980’s by joining, and gradually taking over influential mainstream organizations. He describes how same tactics by similar groups are fundamentally transforming America today. Details at www.libertyandprosperity.org, or contact [email protected] or 609-927-7333.